It's that time again...football Sunday! So bring out the appetizers and dips! This week I decided to go with a blue cheese bacon dip. I wanted something that would go well with vegetables since we ate so many chips last weekend with the Tasty Taco Dip. 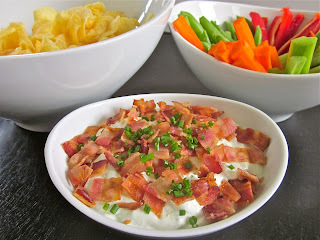 I was originally going to go with a plain blue cheese dip but that didn't say football to me so I piled on the bacon. I preferred the bacon on top because it stayed nice and crunchy, but feel free to mix it in the dip if you prefer. The blue cheese taste really comes through so this is a dip for blue cheese lovers only! And if you have leftovers, you can use it the next day on baked potatoes or burgers, or thin it out with milk to make a great blue cheese salad dressing. In a medium bowl, mix the cream cheese, sour cream, blue cheese, green onions, and chives together. Add pepper to taste. Top the dip with bacon crumbles (or mix these into the dip if you prefer). Garnish with additional chives. Refrigerate until ready to serve (the dip will thicken as it chills). Serve with chips and crudités. Oh, this looks soooo good!